The following directions are for a pan handle that is 6" by 1" wide. 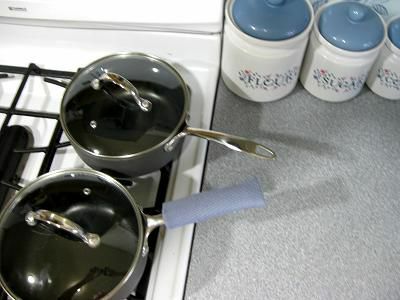 If your pan handle is different, adjust the measurements to suit your need. Fabric - Preferably cotton - not a synthetic fiber that will melt easily from heat—2 pieces cut to 6" by 4 1/2"
One low loft batting such as warm and Natural—cut 6" by 4 1/2"
One Insul-Bright (TM) (or a second layer of low-loft batting)—cut 6" by 4 1/2"
Pig, Lion, Cow, Bird Tail Ideas to Soup up a Costume!